Jaguar Cars MD Mike Beasley has announced that he will retire in April. Beasley (59) joined the marque in 1974 and was elected to the board in 1985 before becoming managing director two years ago. Beasley will be succeeded by Jaguar and Land Rover sales and marketing boss Mike Wright, although he has said that he will continue to work with Jaguar in a number of external roles Mike Beasley, 59, was appointed Managing Director of Jaguar Cars Ltd in November 2001. 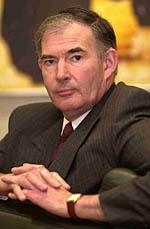 After an early career at Ford of Britain, Mike joined Jaguar in 1974 as the Director of Product and Plant Engineering. In 1977 he was appointed Plant Director of Jaguar, Browns Lane Plant and in 1978 he became Director of Manufacturing at Jaguar. He was appointed Executive Director, Manufacturing and Engineering in 1999. He is a chartered engineer and a Fellow of the Institution of Production Engineers. Born in Slough in 1943, Mike is married with two children and lives in Balsall Common, England. His hobbies include collecting antique cameras and model engineering. He was awarded the CBE for his work with the Birmingham New Deal Task Force and other employment initiatives, in the 2002 New Year's Honours List. Chairman of Birmingham "New Deal" Employers taskforce. Member of West Midlands CBI. Chairman of West Midlands Campaign to Promote Engineering. Visiting Professor in Engineering Management at Coventry University.